When I found out I had been accepted to this fabulous NEH Seminar at Amherst College, I told anyone who was within earshot. And if no one was within earshot, I found people to be within earshot. Which is how I landed in my friend Lynne’s office at school. She’s a counselor. I end up in her office a lot, but she doesn’t help me with MY issues, she helps me figure out how to deal with my students. I told her about Amherst, and when the dates were, and she got all kinds of excited, for unbeknownst to me, she already had plans to be in Boston for the 4th of July weekend. We made plans to meet in Boston–which worked out so well, as her travel friends would be spending the bulk of Saturday and Sunday at Fenway. I took a gorgeous drive to Boston. Route 2 took me through a forest and several small towns, and as I approached Alewife Station to park, I saw a very familiar structure: I was driving past the Boston Temple! I took the subway into town to meet Lynne, and we went here for dinner (I had the salmon). They charged us $7 for water. Fail. After dinner, we walked here for dessert. Lynne got a cannoli; I got a cream-filled, chocolate-covered pastry delight. Sunday we did the touristy Boston kinda thing. 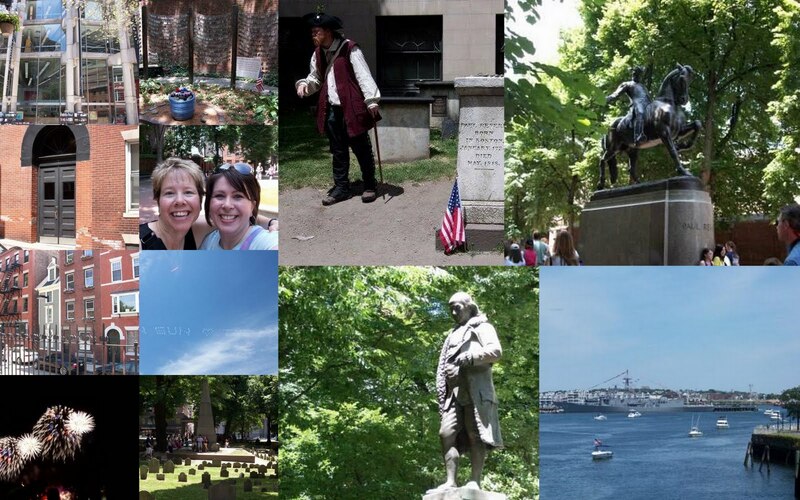 We walked the Freedom Trail, hung out in Boston Common and people watched, and at 7:30, we headed toward the fireworks, which I already blogged about here. What hadn’t happened yet, though, at the time of that post, was how amazing the fireworks were. I felt like a tiny tiny kid, they were so mammoth. I was awestruck. So were the other 500,000 people there–NO ONE SPOKE. We oohed, we aahed, but no one spoke. I like to visit big cities. I like the public transportation, I like the history, I like (love!) the food options. But I also like my current small town abode, and my mid-size home .